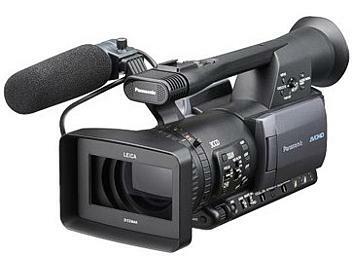 The AG-HMC154 is a memory card camcorder with excellent image quality and high reliability. The AVCHD format employs the new MPEG4 AVC/H.264 codec to deliver approximately twice the compression of the HDV format which uses MPEG2. The AG-HMC154 supports higher bitrate recording mode (PH mode) which realizes higher quality of video images for professionals. Shutter Speed: 50i/50p mode: 1/50 (OFF), 1/60, 1/120, 1/250, 1/500, 1/1000, 1/2000 sec. 25p mode: 1/25, 1/50 (OFF), 1/60, 1/120, 1/250, 1/500, 1/1000 sec. (Synchro Scan) 25p mode: 1/25.0 sec. to 1/248.9 sec. Slow Shutter Speed: 50i/50p mode: 1/12 sec. and 1/25 sec.